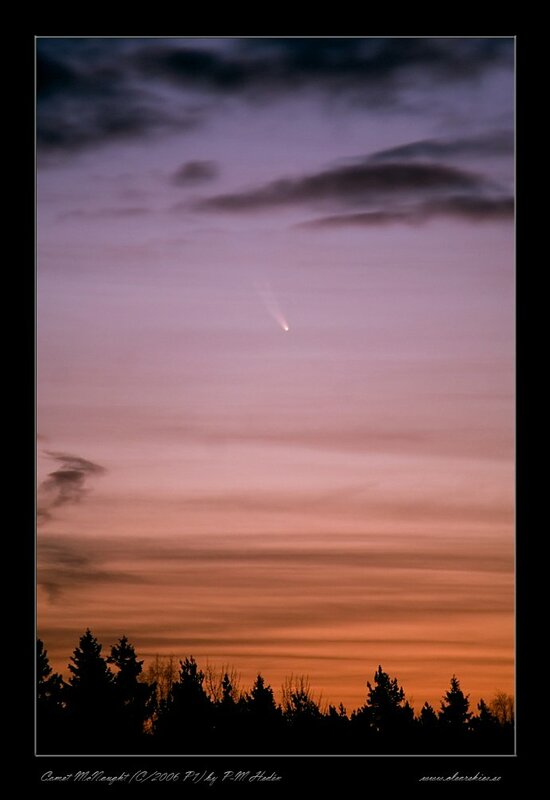 Even a clearer view of the comet between clouds. 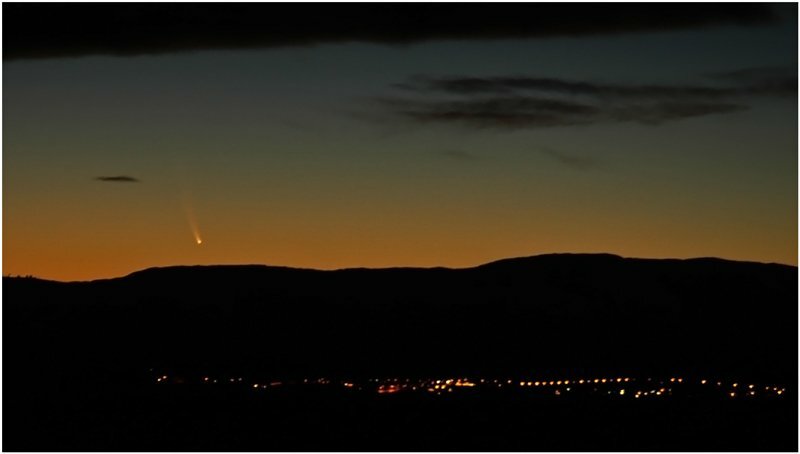 What a great view it is to see comet McNaught! Think what nature can bring to us, so everybody get out and enjoy it....it's for free!!! 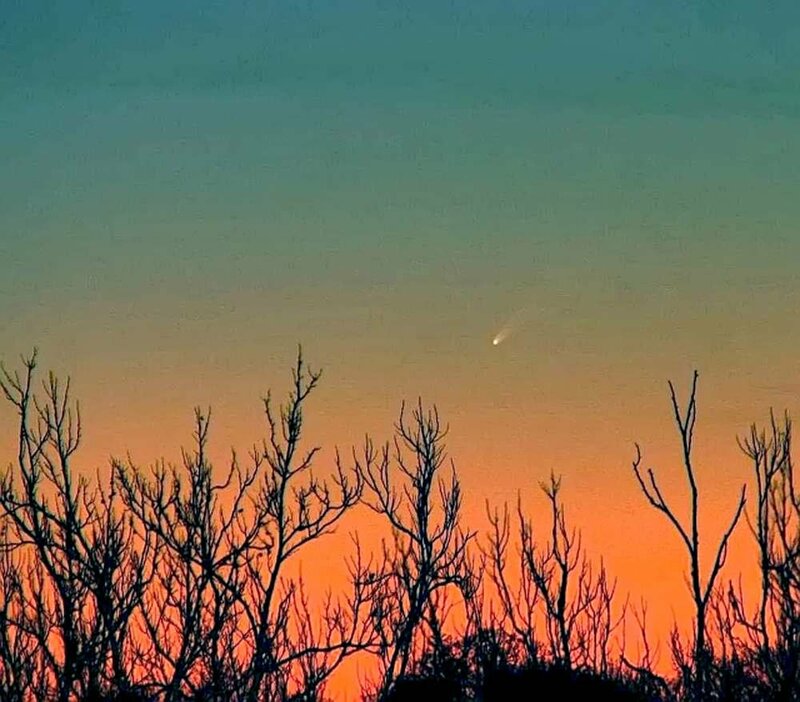 When I stepped outside this morning, I stopped short on my doorstep as the sight on the morning sky was marvelous. 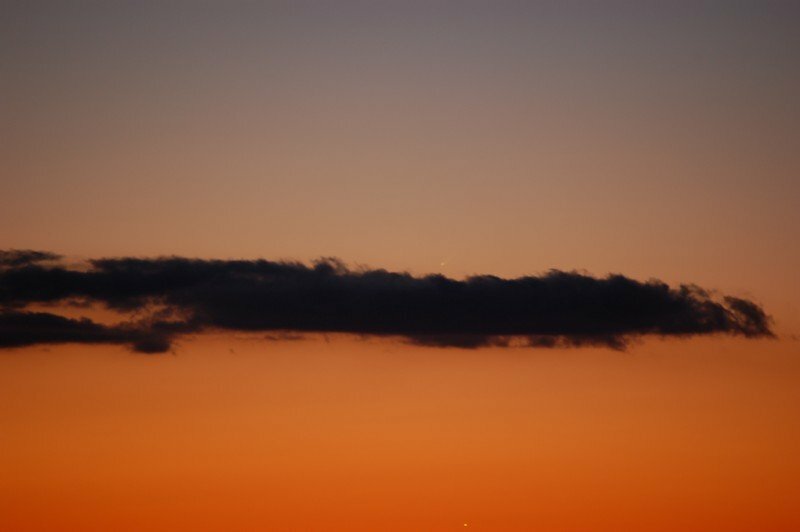 Comet McNaught was shining almost as brightly as Venus. 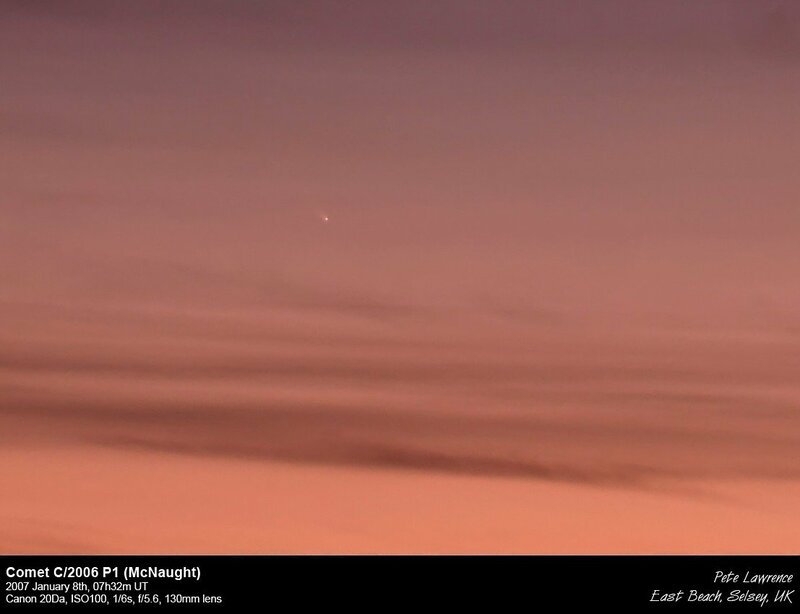 The inset shows the comet in full size. You can see a darker lane in the middle of the tail. I was also able to see that phenomena in my binoculars. The inset is a stack of 19 individual images (to reduce the noise). 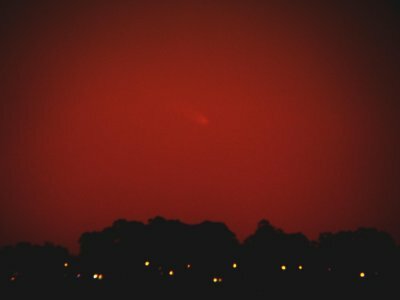 After watching a break in the seemingly neverending clouds that have been covering the UK for many weeks now, I got an oppotunity to see Comet C/2006 P1 McNaught this morning. 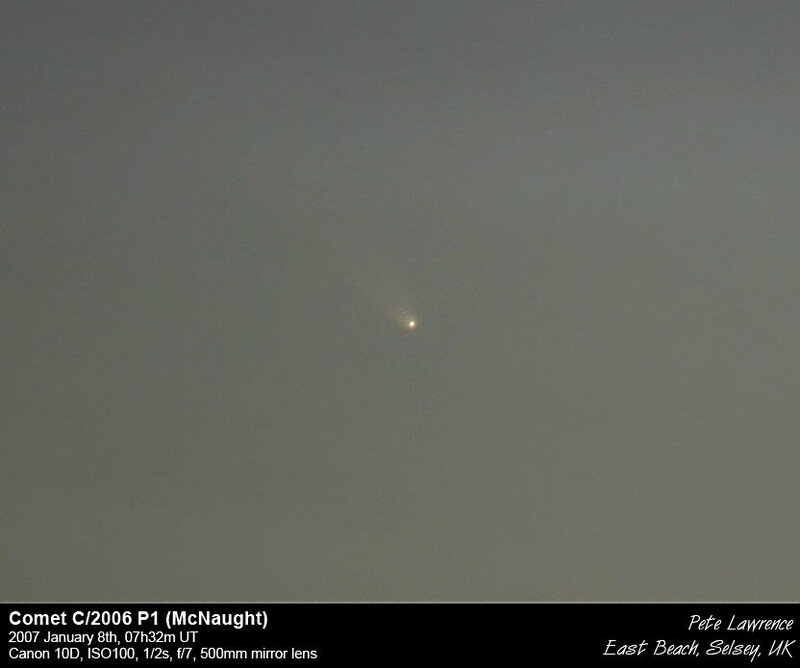 It's very bright indeed and I was able to follow it until 07:40 with the naked eye! 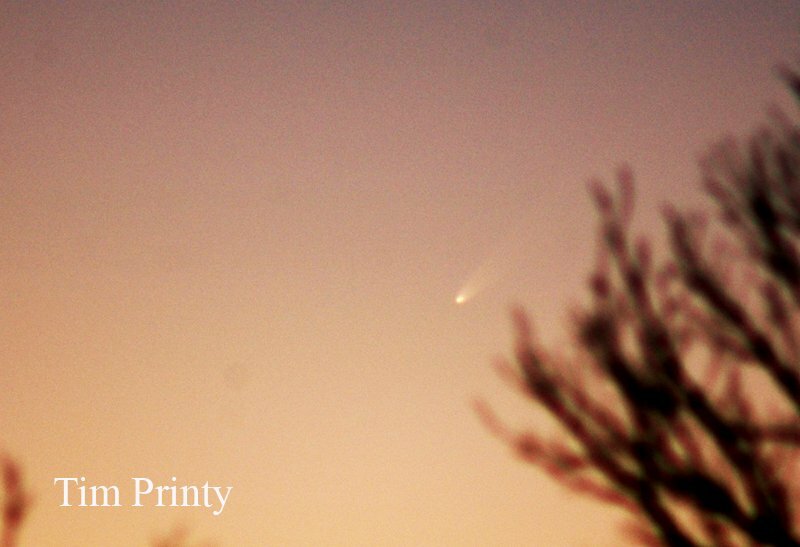 A short exposure will reveal the comet's head and tail well. As it's visible in the morning and evening twilight, it's really worth putting in the effort to try and catch this beautiful sight. 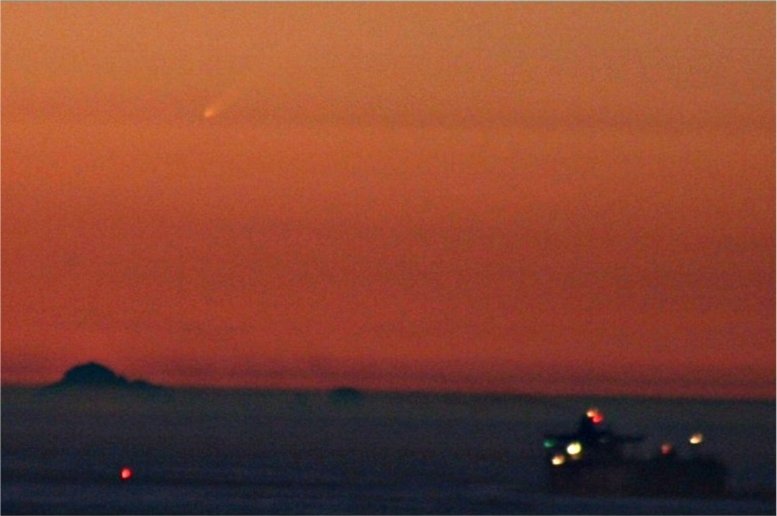 I believe it was the most Southern known sighting of the Comet McNaught (C/2006 P1). 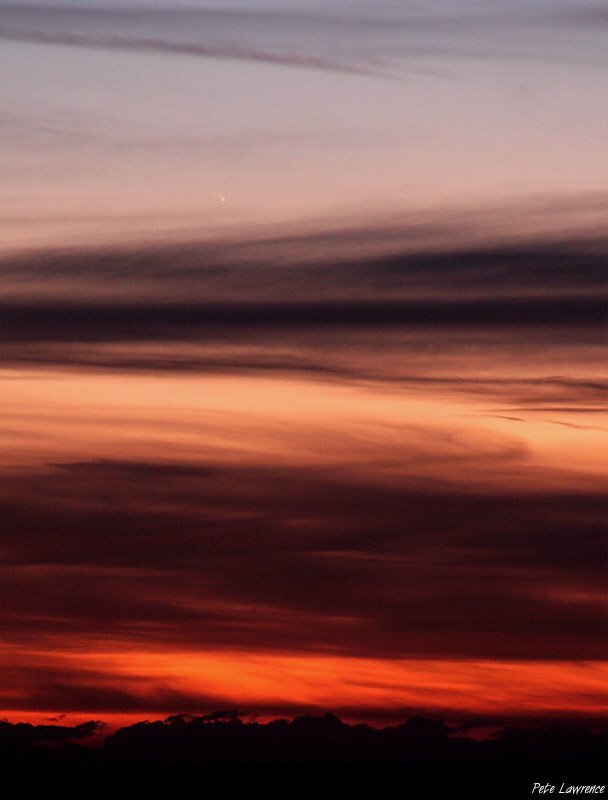 For 5 nights in the row I was trying to see the comet McNaught, but with the ever present Marin layer and with latitude 37.66N it seemed to be practically impossible until tonight. 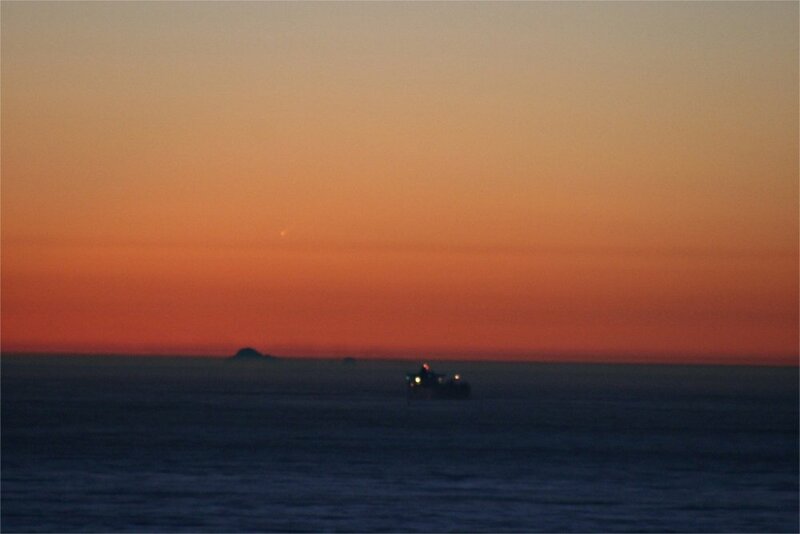 Tonight I even was able to see Farralon Island (a really rare event in San Francisco). 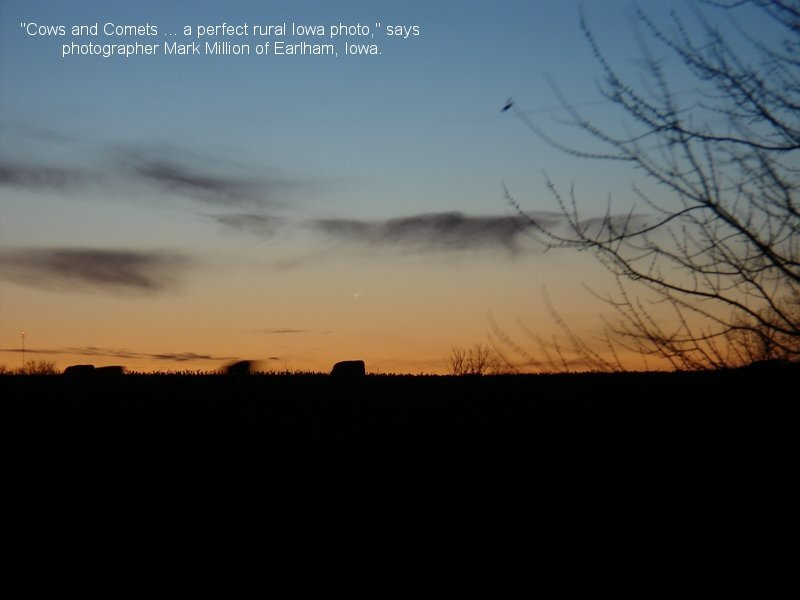 Marin layer was still there, but it was lower and maybe not so dense as last few days and I did see the comet! 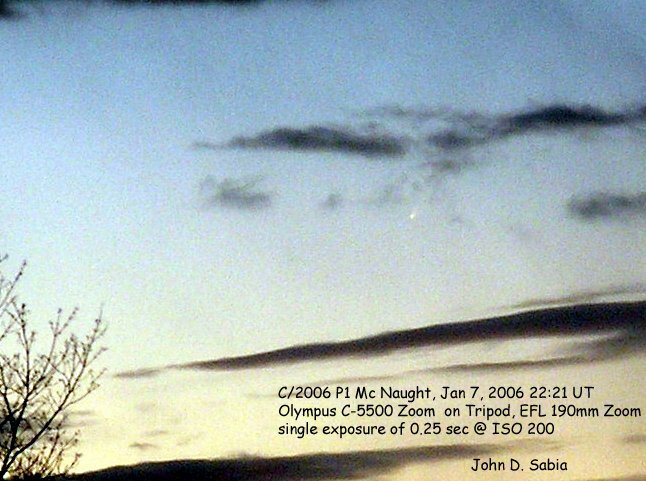 Photo details: Canon XTI, 300 mm lens, 1 second exposure, ISO 400. 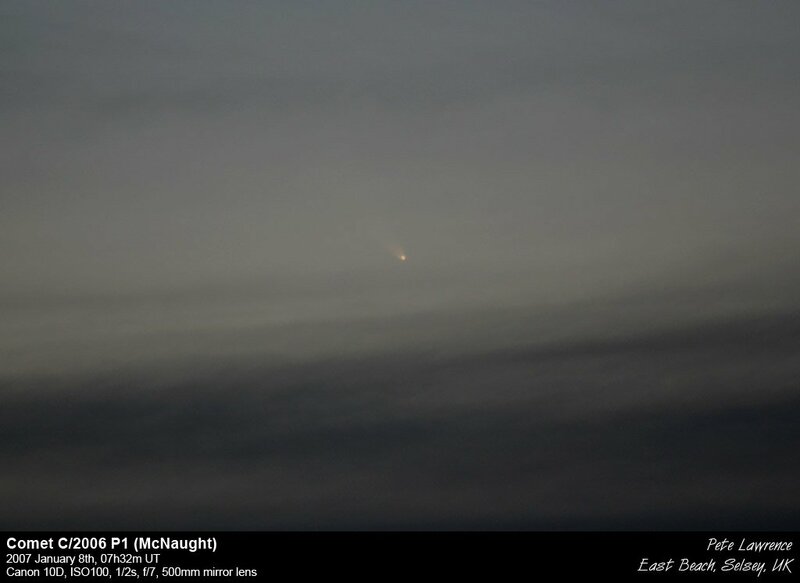 I found Comet McNaught about 25 minutes after sunset. It was about magnitude -1 with a short tail. I managed to get a few pics before it set into the treeline. 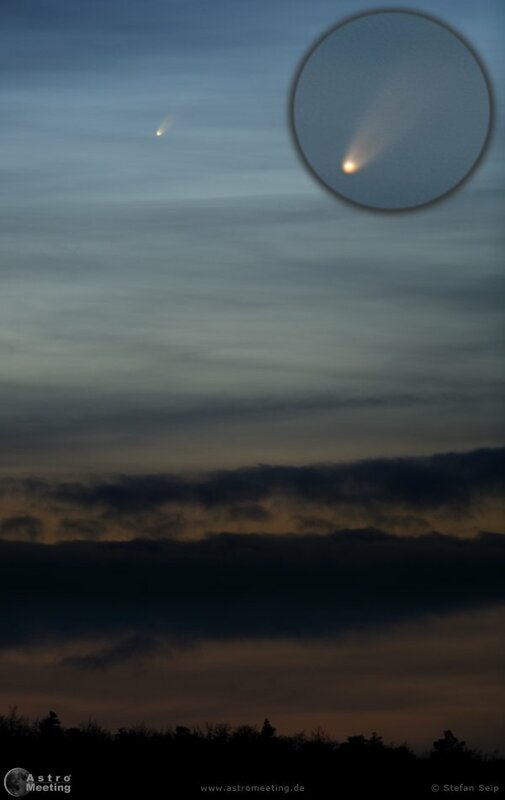 Photo details: This is a stack of 7 images taken with a Nikon D70 set at ISO 200 using a 400mm F5.6 lens. Exposure time was 1/25 sec.